Normally, for inserting images based on related URLs or file paths, only VBA code can help you to deal with it. 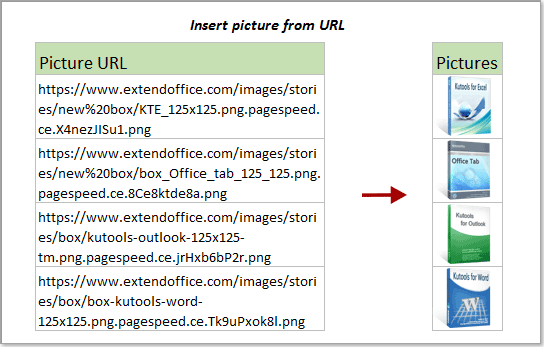 Here, with the Insert Pictures from Path(URL) utility of Kutools for Excel, you can quickly insert images from related URLs or file paths in Excel with only several clicks. For inserting images from URLs, please do as follows. 1. Enable the feature by clicking Kutools > Insert > Insert Pictures from Path(URL). Then all pictures are displayed based on the given URLs as below screenshot shown. If you want to display images from file paths, please try as follows. 1. 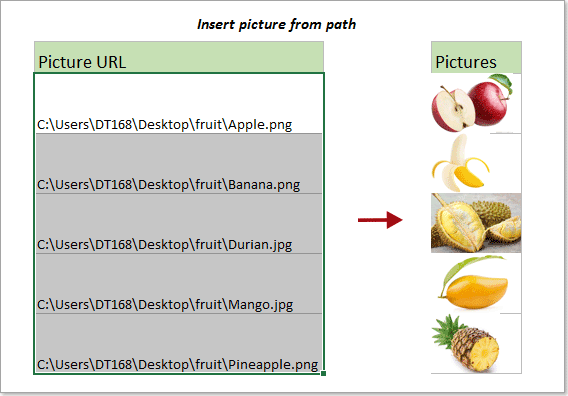 According to the Excel specifications and limits (https://support.office.com/en-us/article/excel-specifications-and-limits-1672b34d-7043-467e-8e27-269d656771c3), the width of the inserted pictures must be less than 2045 pixels, and the fixed height must be less than 547 pixels. 2. If the specified size is exceeded the limited size, the inserting pictures will be automatically adjusted.